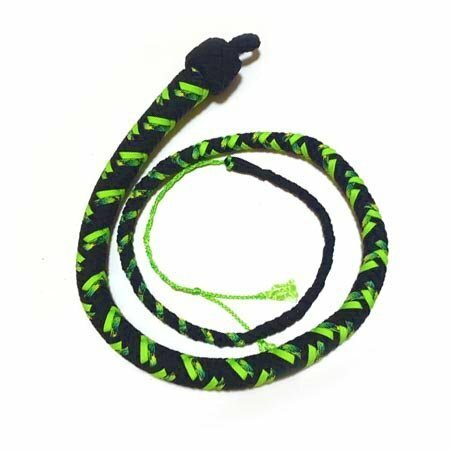 Looking for an excellent singletail whip at a fair price? This locally-made piece by Katana Works is made from braided black and neon green/black patterned paracord. At 3 feet, you can crack this easily indoors and in more confined spaces. Great for beginners and experts alike! Comes with extra crackers that you can replace yourself. PLEASE NOTE: Because each whip is crafted individually, the exact pattern/appearance of the braiding may look slightly different than the photo shown.